Arlington Place of Grundy Center is a very nice, clean community. They have very caring staff who check on my mother a lot and are very good. She likes the food and really likes that she doesn't have to cook anymore. They do some games a lot of the afternoons and also have music. Her room is very nice, and I think the place is very good. The price is pretty high, and I wish it's a little less. Thank you so much for your kind and positive words regarding your mother's home at Arlington Place. We are so very lucky to care for her and provide your family with peace of mind. We appreciate your feedback immensely. We visited Arlington Place of Grundy Center for our mom. It was a nice, clean place that seemed to have people doing their jobs and people were happy. We saw people visiting, putting puzzles together, and talking with each other. They had a little common area for table activities. They also have an enclosed outdoors area, but I didn't see an exercise room. The couple of male staff members were really friendly and seemed to know what they were doing. I would say it's a well-run community. Thank you for your review, Terrance! We are so happy to hear you were pleased with your visit to Arlington Place and will be sure to share your kind words with our team members. 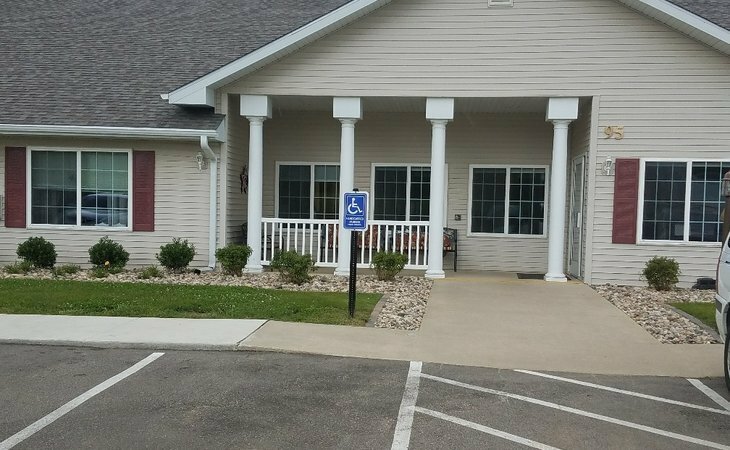 Should you need Assisted Living or Memory Care services, we hope you'll choose Arlington Place in Grundy Center for your family! Arlington Place of Grundy Center was very nice and we had a good tour. The manager showed us all around, they recently added memory care and everything has been updated. We had a good lunch there and we were introduced to some of the other residents as well. It's a nice place and the rooms are a nice size. One thing I was really impressed with was how clean it was, and it's not old enough that it's aged very much. The day we were there, a bunch of old ladies were doing some baking. We had met the men earlier that week, they were visiting a horse farm over in a neighboring town. They also have activities and exercises, and it has a very pleasant environment. The food is good, they had a salad bar and we had fish as an entrée. Arlington Place of Grundy Center is very nice and very modern. It would meet my dad's needs. It still would allow someone to have some privacy, but yet, I didn't have to worry about my dad falling and somebody not finding him. It is very good. I like the place. The staff members were very courteous, very nice, and very helpful. They were outstanding. The rooms were very nice, up-to-date, and clean. They offer a lot of amenities. Arlington Place of Grundy Center had a great room with a TV, and the eating area was decent and open. They had a rec area and an outdoor space, but they're going to cut out of the view of the outdoor space because they were adding on, so that was kind of disappointing. They had a really great view for outdoor space. The staff is decent and good, and I like them. They had studio, 1-bedrooms, and 2-bedrooms, and they were decent. Thank you very much for taking the time to review Arlington Place of Grundy Center. We are happy to hear that you are satisfied with your experience and appreciate your feedback regarding the expansion. We hope you will visit again when construction is finished for another look! Arlington Place of Grundy Center is located in the heart of Iowa. We are dedicated to providing affordable, quality assisted living options. At Arlington Place, we are the only local community that offers an individual service plan that is truly centered around your specific needs. We won't put you in a rigid classification, put you on a level or in a stage. Your individual service plan is as unique as you are. Arlington Place will cater to your needs by offering you assistance with daily living activities. Arlington Place is dedicated to providing a quality, caring, enjoyable, home-like atmosphere for residents, families, and employees that promotes independence, dignity, and growth opportunities through a supportive team approach. Our team of professionals is dedicated to customer service and is committed to providing the best services. With years of training and experience, you are in good hands at Arlington Place. What should caregivers and potential residents know about Arlington Place of Grundy Center?